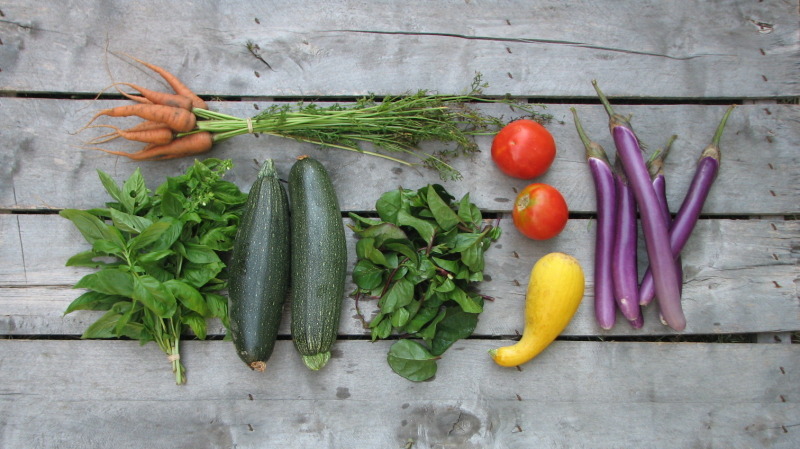 Welcome to this week’s CSA share! Malabar Spinach- This is quite a unique green that is incredibly nutritious. Try in a soup like minestrone or in place of cooked spinach in a pasta dish. Check out the kitchen blog to read all about malabar spinach. Summer Squash—Have you tried our squash on the grill yet? It’s excellent! Some of you received the smooth skinned yellow squash and others received our nubby yellow crook neck. Zucchini—This is the last of the zucchini and squash. The plants held up well for several weeks, but in our chemical-free production methods we always end up losing them to insects, despite our best organic efforts. But it’s no sweat! We plant a lot, just for that very reason. Eggplant— The small shares received the fairytale eggplant and the large shares received the slender Japanese variety. I like to slice these in half down the center and splay them out on the grill till lightly charred. Are you unfamiliar with cooking eggplant? A hot griddle or grill can give you lots of possibilities with this great crop. Low heat methods tend to make them kind of mushy or greasy, so stick to high heat. Try these Summer Eggplant Rounds. In this recipe I lay out basic preparation for eggplant. Another market customer raved about this eggplant pizza recipe from Pioneer Woman. Basil—Large-leaved Italian Genovese variety. Excellent for caprese salad, pesto, and pizza. If wilted, trim the stems and place in a glass of cold water to perk up, but don’t put it in the fridge. Store in a glass of water on the counter and change the water every couple of days. Slicing Tomatoes—for the large shares only. We predicted correctly! These are the last tomatoes the plants will produce until temperatures drop back into the upper 80s. As long as they stay healthy throughout the rest of the summer, they could produce for our fall CSA, which would be great. Summer carrots—for large shares only. I cannot tell you how strange it is that we are harvesting this cold-season crop in August. We’re had a lot of surprises this season! This is truly a rare treat, so I hope you enjoy them! Cherry Tomatoes—for small shares only. You may have received Sungolds or our unique Indigo Rose tomato. Like other purple fruits like blur berries and blackberries, these indigo rose are super high in anthocyanin, a cancer fighting compound. They also happen to be delish, so eat up! As a general rule, almost all summer crops can’t tolerate fridge temperatures in the 30s and 40s, so they should mostly be stored at room temperature. Everything will need a gentle washing before cooking. Another general rule- wait to wash any veggies until you’re ready to use them to help retain nutrients and prevent spoilage from excess moisture. Bruised or nicked produce should be eaten quickly as it will begin to spoil faster. Large share from top left: summer carrots, Genovese basil, zucchini, malabar spinach, slicing tomatoes, yellow squash, and Japanese eggplant. 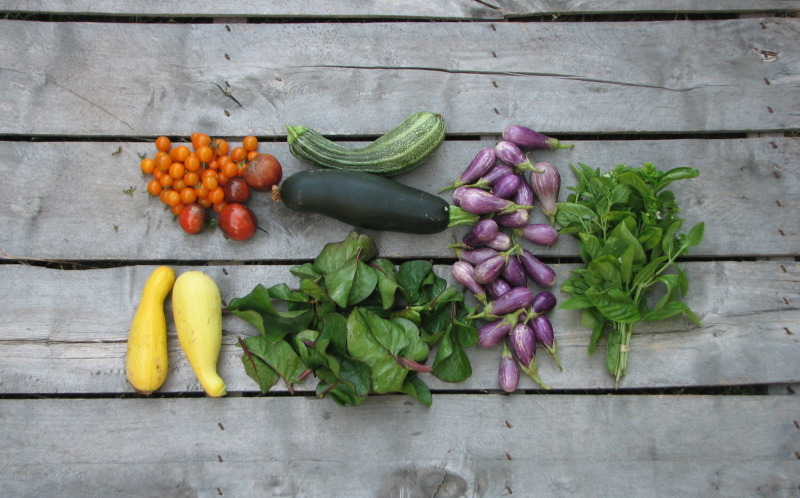 Small share from left: Sungold or Indigo Rose tomatoes, yellow squash, zucchini, malabar spinach, fairytale eggplant, and Genovese basil.